Who exactly is–well, was–John Fitch V? That’s a long story in and of itself. We have to go back through the mists of time to the mid-1990’s. Sean had just begun freelance sportswriting for his local newspaper, the Sentinel & Enterprise. He was still in high school at the time, yet during his senior year, he was in the office pretty much every day, doing everything he could and taking in as much as he could. While there, he spoke often with the man who did the obituaries and the chess column. He told stories about one particular columnist named John Fitch IV, who was the popular author Robert Cormier, who lived in nearby Leominster (he passed in 2000). Sean thought that it was interesting that an author also wrote for a newspaper. 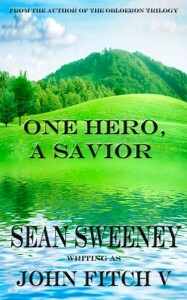 And since Sean was supposed to have read The Chocolate War by Robert Cormier during his freshman year, he thought that if he ever wrote a book–and he had thought about it quite a bit–it would be a pretty cool way to honor a local author by changing the name of Cormier’s columnist pen name. He created the name John Fitch V in honor of Cormier. Under the name John Fitch V, Sean wrote six full-length novels: The Obloeron Trilogy (the second half of the re-released Obloeron Saga), Turning Back The Clock, A Galaxy At War, and One Hero, A Savior. He also wrote the short stories Sidetracked, Amber Twilight, and The Mastermind under this pen name. With the passage of time and maturity, Sean retired the John Fitch V pseudonym in 2011.